Yesterday morning it was an odd experience watching snippets of the inauguration of the 45th President of the United States. There was emotional confusion, poignancy and unease. The rituals, the trappings of the office and the responsibility it bestows heightened a sense of expectation, even awe. In fact, there were moments when it was as if the contentious individual at the centre faded, and the greatness of the office took over. Perhaps that is what such grand ritual does – it draws us past the individual’s unworthiness or worthiness – to awareness of something greater, a call or charge greater than anyone can quite grasp. The moment captures a hope, a call and a vision; on the far side of which may lie much good and also much disillusion and disappointment. I remember a moment of ‘call’. I was just seven years old and my mother took me to hear an evangelist. There was the moment in the service when people were invited to put up their hands if they wanted to commit to the Lord. My hand went up and it was as if there was an irresistible gravitational pull that drew me forward to a gentle wise man who explained to me the story of salvation using a tiny book with (I think) just pages coloured black, red and white to image the experience of conversion. I vividly remember walking back home with my mother and her friends that night – and it was as if I was floating. I knew I had been called; that I belonged. All that was a long time ago, but even now just the memory startles me and warms my heart and helps me remember other moments when the sense of call and the presence of God has been known again, and again, and again. I talk of ‘heart-warming’ – but that’s a famous phrase from the Methodist tradition: when on 24 May 1738 John Wesley attended a meeting in Aldersgate and heard a reading from Luther’s Preface to the Epistle to the Romans. That evening he wrote in his journal that at about 8.45pm “while he (Luther) was describing the change which God works in the heart through faith in Christ, I felt my heart strangely warmed. I felt I did trust in Christ,…” The moment in Aldersgate was the moment of call for Wesley. I don’t think this sort of experience is at all unusual. I believe it is ‘wired’ into our capacity as humans ‘made in the image of God’. However I think the diversity of the experience is something we need to be open to. It may be an appeal to heart or head, or both; a response to beauty, to grace, to compassion, an awareness of goodness. It may be when we ask why a poem just breaks our heart, or how leaves shining in sunlight after rain may stir us. The gates of the soul are varied and the call of God may be nuanced in ways we have never anticipated. Best of all, Sunday by Sunday we come to the Eucharist to ready ourselves for God’s call, for our heart and mind to sense the call that will draw us deeper into God. And so in Matthew’s story, by the sea at Capernaum, the work of Jesus begins. We hear of his calling disciples, but there is a strangeness about the calling: it seems so unplanned and almost casual. He walks by the sea and arbitrarily summons Simon Peter and Andrew. No explanation or rationale for this invitation is offered; we have no information beyond the words “Follow me, and I will make you fish for people”. We note the word play generated by their occupation and the new calling to which Jesus invites them. 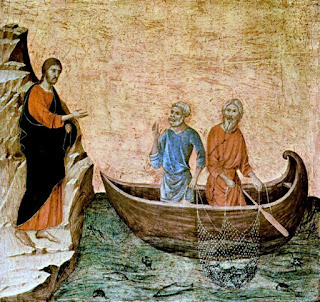 We should not underestimate these men Jesus summons: to be fishermen does mean that they were yokels or simple folk; they ran a business, owned boats and nets; were involved in a stable and sustainable way of life; none of this is something to be undervalued or lightly walked away from. Two things are quite striking about this ‘calling’: first, Jesus breaks with Jewish customs because the normal practise was for disciples to find their teacher, not for the teacher to find them. Second, is that Jesus approaches them in the midst of their activities – while they are working (in medias res) not, it would seem, while having a lunch break or at leisure. If we are to try and think these aspects through a little - it seems to me that in the business of the call, God takes the initiative and the call comes in the midst of our living – not when we think we are ready. There is also a third point: they respond to Jesus immediately – and from that we may conclude that there was that about Jesus which was attractive and compelling.